Last week, we went up to Ubud to visit our friends Marcello and Michi at Gaya Ceramics and to have a look at their sale items to add to our growing collection of Gaya plates and platters. After an hour spent looking through their shelves, we went to have a coffee at Cafe Seniman which I had heard about from friends of Novita who had recommended it as a good place for coffee in Ubud. 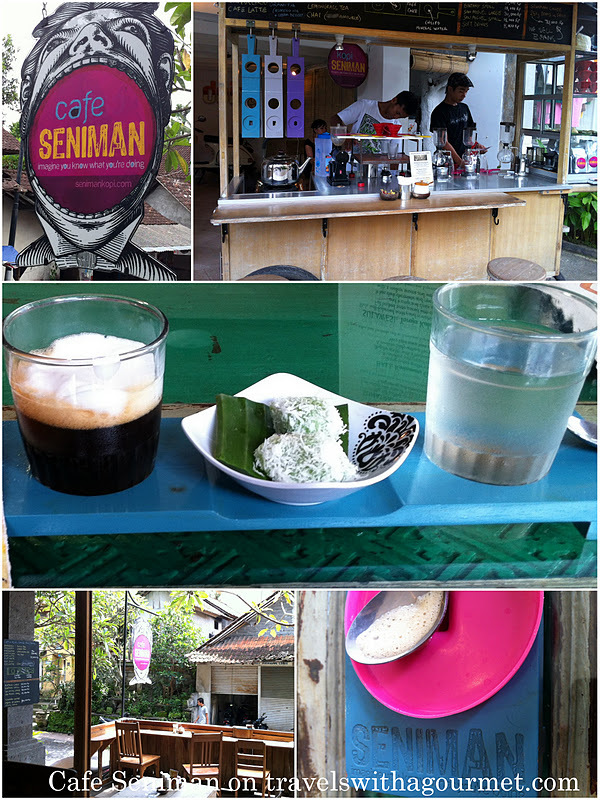 Cafe Seniman is off the main street Jalan Raya Ubud and is a tiny two-story cafe with a wooden coffee cart with a few stools right by the entrance and a few more tables further up on the terrace. The place is simply decorated with the focus on their coffee- organic, made-to-order brew of specialty Indonesian coffee. On that morning, they had the Sumatra Gayo mountain coffee bean which is their house bean and two others: Sulawesi Toraja Kalossi and the Kintamani from Bali. I had a Sulawesi espresso macchiato served on a special wooden palette which held a glass of water and a tiny plate of local coconut-encrusted rice cakes. Service was friendly and the barista clearly knew what he was doing. It was a good early stop after a morning of retail therapy at Gaya. *Open daily from 10 a.m.